The greatest toy in history has come a long way. When Obi-Wan gave Luke Skywalker his father’s weapon from a more civilized age, the must-have toy of the millennium was born. Since Star Wars became a cultural phenomenon in 1977, kids and adults alike have lived out their dreams fighting the Empire wielding toy lightsabers — the perfect marriage of science-fiction and medieval romance — which have dramatically evolved since they first hit retail almost 40 years ago. In commemoration of Force Friday II, which marks the incoming tenth movie Star Wars: The Last Jedi, here is the collected history of toy lightsabers. Believe it or not, there was a time when Star Wars toys were non-existent — the infamous cardboard Action Display Stand is mythical in the history of toy collecting. But in the summer following the release of the 1977 film, bootleg manufacturers went after the mountains of money on the table and produced knock-off lightsabers to fulfill the void. 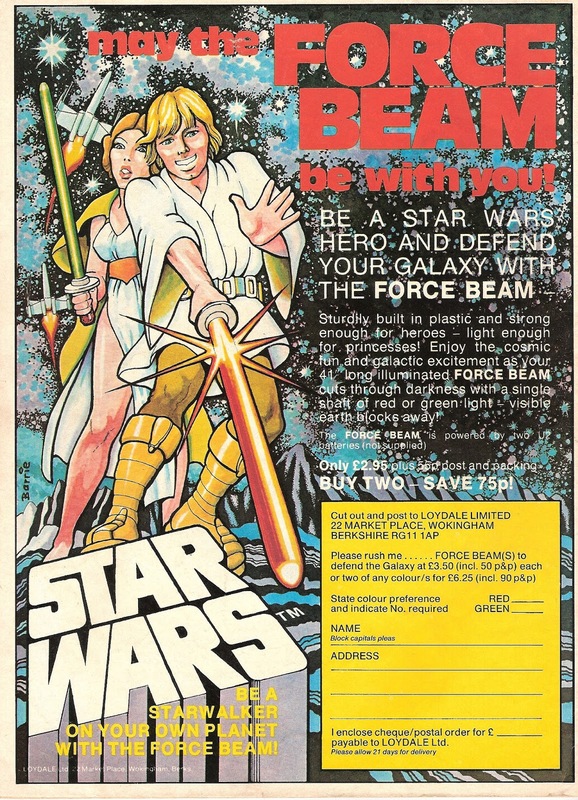 Enter: The Force Beam, one of the most infamous bootleg toys that shamelessly rips off the Star Wars IP while forgetting to make something accurate. A year after the Force Beam, Kenner finally capitalized on the phenomenon by unleashing the first official toy lightsaber. Recognized for its inflatable yellow blade — which wasn’t screen accurate, but it did match the Luke Skywalker action figure — as well as its ability to light up, Kenner’s official “Light Saber” is a charming relic of another time. No, it looked nothing like the real thing, but that really wasn’t the point. On the other side of the Pacific ocean, Japanese toy manufacturer Takara produced a sturdier and fancier lightsaber that had one amazing feature: the ability to change color via round swappable discs slotted in the hilt. Also, the blade wasn’t inflatable but hard plastic, which would have made this toy a must-have had it not been so hard to obtain even back then. Star Wars was huge, but 1980’s The Empire Strike Back was a game-changer. So it was appropriate the toys got an upgrade, too. In 1981, Kenner released “The Force Lightsaber,” a new toy that came in two blade colors, yellow and red, and made a “whirring” whistle when swung. Though it sounded nothing like the static-y hum lightsabers are supposed to sound like, it was proof that big change was on the horizon. In 1983, Kenner re-released the Force Lightsaber, but with a green saber to match Luke’s lightsaber in The Return of the Jedi. By the mid-’80s, Star Wars was a juggernaut franchise. So in 1985, George Lucas created and produced Star Wars: Droids, an animated prequel to A New Hope that followed C3P-O and R2-D2 in their misadventure across the galaxy. To coincide with the show, Kenner released what would become the last lightsaber toy the manufacturer would produce: a Droids lightsaber, which came in red and green on a hilt that vaguely resembled Obi-Wan’s saber in A New Hope. There pros and cons to the Droids lightsaber. On the upside, kids finally had a lightsaber that could actually pop out of the hilt and light up via AA batteries. No more whistling, no more balloons, kids were finally close to the real deal. On the downside, it was about as long as a popsicle. So, the fun pretty much stopped there. The early ‘90s were a dark time for the Force. But in 1996, Lucasfilm and 20th Century Fox — in a move that predates the slavish restoration seen in home video releases today — re-released the original trilogy on VHS with significant “clean up” by George Lucas’s THX. With Star Wars back in the public consciousness, toy maker Hasbro began their domain in a galaxy far, far away with sophisticated lightsaber toys that not only lit up and had retractable blades, but also molded hilts based on Darth Vader and Luke Skywalker’s blades from Return of the Jedi. While the blades didn’t retract all the way, every kid’s Luke and Vader Halloween costumes finally looked a little less lame. These two lightsabers would go on to define the look and feel of toy lightsabers for decades to come. As hype for The Phantom Menace soared through the stratosphere, of course there were toy lightsabers, and never had they been closer to the real thing. Fully electronic with all the actual sound effects, plus a massive glow when two blades “clashed,” The Phantom Menace once again raised the bar, all while spoiling a new generation of younglings who didn’t have to inflate their lightsabers. And yes, 1999 saw a toy version of Darth Maul’s epic double-bladed lightsaber, perhaps the coolest, most badass toy of the year. But Hasbro wasn’t the only manufacturer who got in the action. Rubie’s, still one of the world’s biggest producers of Halloween costumes, also released slimmer lightsabers as accessories for the company’s line of Star Wars costumes (including Darth Maul!). But unlike the Hasbro toys, these lightsabers came with a revolutionary feature: fully-retractable blades, which is now practically mandatory for all lightsaber toys. The prequel era of Star Wars saw a horde of lightsaber toys that came in varying tiers. Basic, non-electronic lightsabers with fully-retractable blades (and even a belt clip!) could now be picked up in virtually every toy aisle. Higher-tier toys, such as ones modeled after Count Dooku and Mace Windu, came with all the bells and whistles that made adults growing up in the ‘80s as envious as a Sith. But in 2005, during the release of Revenge of the Sith, Hasbro unleashed the Build Your Own Lightsaber toy kit, which allowed kids to feel like a real Jedi by assembling an elegant sidearm of their own design. While the kit was ultimately just recycled hilts (Obi-Wan, Vader, Yoda, Maul, Mace Windu, and the Emperor) that could be mixed and matched, plus red, green, and blue blades via swappable discs (reminiscent of the Takara lightsaber), it was still a novel premium toy that continues to live on in Hasbro’s catalog. Today, visitors at Disney’s theme parks can build their own lightsaber using the same design and concept as this popular toy. With the 30th anniversary of Star Wars in full swing, Hasbro finally gave adult collectors something they’ve wanted all along: ultra-accurate lightsaber replicas. Initially released under a “Master Replica” label, the Force FX lightsabers came in lightweight aluminum metal that performed all the lights and sounds expected of a real lightsaber. While custom replica lightsabers had been (and still are) a popular thing among collectors, those wishing to perfect their cosplay could finally do so with ease. When The Phantom Menace returned to theaters in a snazzy new remastered 3D format, Hasbro produced a kid-friendly, more affordable version of the Force FX lightsabers in a new line dubbed “Ultimate FX.” Although made of plastic and carrying shorter blades, Ultimate FX lightsabers were and are the perfect balance between toy and replica, letting kids really feel like a Jedi or Sith Lord without breaking something that cost $200. Initially released in Anakin Skywalker and Darth Vader builds, the Ultimate FX line has since expanded to Rey/Luke and Kylo Ren. 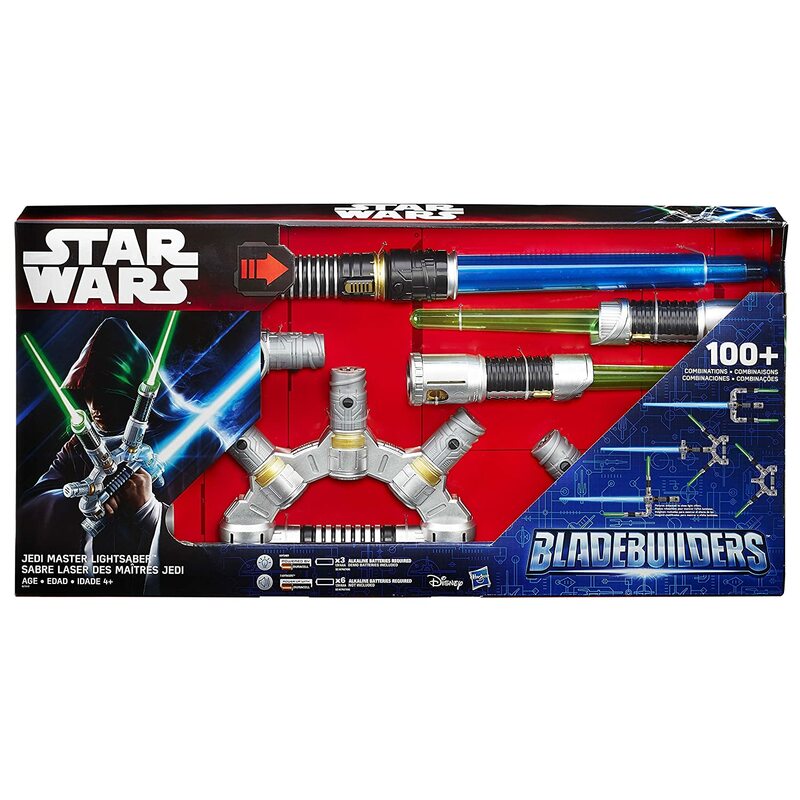 For The Force Awakens, Hasbro rebooted the Build Your Own kit into a complicated thing called Bladebuilders. It’s pretty cute. Anyway, you can still buy normal, tried and true lightsabers with whatever options you want. The Force is truly with us now.